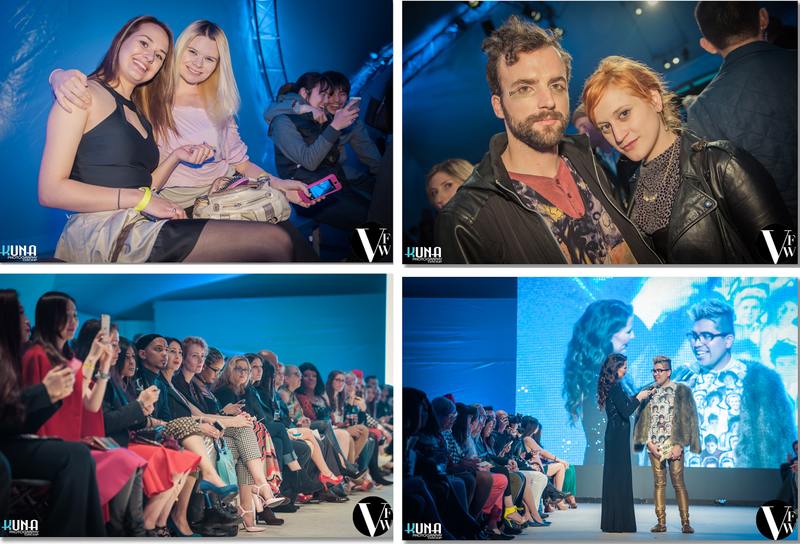 Day five of runway shows at Vancouver Fashion Week (VFW) saw a much welcome return to sunshine. The wet spots were clearing up, although backstage still had challenges. I again want to say kudos to the staff, the volunteers, the models - everyone involved - for dealing with this issue so professionally. The shows ran smoothly and you just wouldn't know from the audience's perspective anything was going on. Kudo's on a job well done! The mix of shows this day was truly inspiring! My wonderful friend Shravan Ramaswamy returned for his third season at VFW - opening the night with a stunning show and receiving a well-deserved standing ovation from many of us. Because of the depth of his show - I will be featuring him in a separate article next week so I can include more information and a larger grouping of pictures. The evening continued on with a wonderful variety of styles offered on the runway. When you sit through all shows every day - well over 50 shows this week - you need to see an ever changing range of styles to keep your focus sharp. Yesterday the mix was perfect. My outfit was one with an interesting story - and I love my clothes to have a story. The top is by RV Designs. 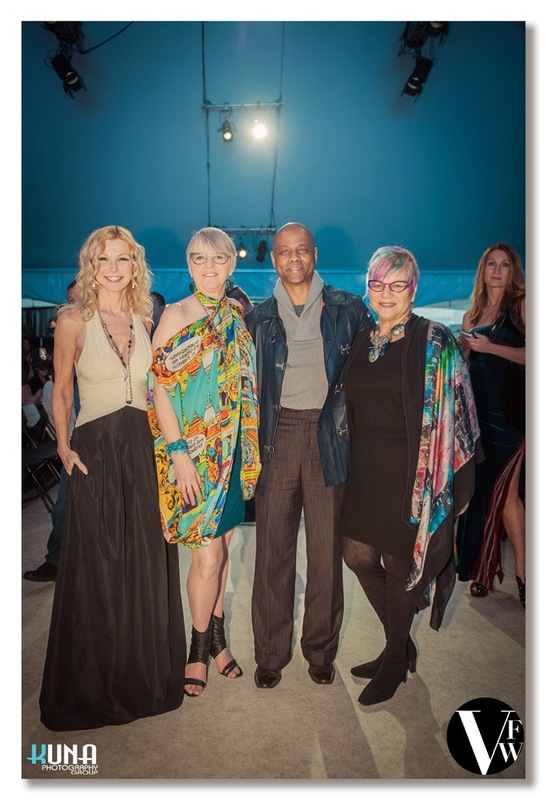 Designers Theresa James and Roger Prince were students emerging from the fashion design program at Blanche Macdonald when I first met them. They showcased their graduation collection at VFW in April 2010. I was so sad when they moved to Newfoundland, but continued to follow their career. In 2012, they created a special collection which featured on the runway at Lakme Fashion Week. This beautiful silk blouse in an original print was part of that collection. It's one of my cherished treasures. This evening I paired it with a deep turquoise knit skirt by JAC. The two bracelets (one was actually a necklace wrapped 3 times around my wrist) are both special to me as well as they were gifts from Shravan and worn this day in honour and support of his runway show. Saturday was the toughest in terms of who to cover as each designer so unique. In the end I decided to feature José Hendo, Teresa Farese, Marko Feher and Hong Kiyoung. but I cannot stress enough that you really should take a moment and check out the other great collections shown this evening. And be sure to check back later next week for individual articles on both Sunny's Bridal and Shravan Ramaswamy. I also have a third surprise article coming - something that will be a first for me on this site. SHHHH - It's a secret! Award winning, London-based designer José Hendo's runway offering was full of truly unique silhouettes. I was instantly intrigued. Until reading her bio this morning, I did not realize it was also an eco line. Here is an excerpt, "The label...uses eco-friendly fabrics as much as possible, creating unique, one-off pieces, from organic barkcloth, cotton, hemp, used garments such as suits, denim, wedding dresses etc. ‘ José Hendo’ promotes the use of organic, eco- textiles and recycled materials. Supports ethical trading, fair working conditions and raising awareness about the environmental issues affected by the fashion industry...Jose’s keen eye and attention to detail, together with her character as a perfectionist, can be seen in the quality of the work produced. All garments are finished to an exacting standard." She is the go-to designer for Ugandan Royalty and has shown at London, Berlin, New York and Kampala fashion weeks. Hendo has eight collections to date inspired by her African background, sculpture and nature. Fabrics embraced include bark cloth, upcycled materials, end of roll fabrics, organic cotton and hemp, eol denim, eol silk and eol wool. The very sculptural nature of her looks last night are what drew me in. Hendo really has an impressive eye for proportion, drape, detailing and creating visual flow. I particularly loved her use of one colour, structured fabric to hold and highlight the intriguing shapes paired with linings in print fabric that peaked out subtlely. Great palette, great variety, great styling - wonderful show all around. I adore wearing interesting pieces and this designer had a great balance between interesting and beautiful construction. The quality of Italian designer Teresa Farese's collection took my breath away. Each piece was created from luxurious fabric, perfectly proportioned and tailored to couture standards. As someone who has sewn all my life, I was in awe. This skill comes as no surprise if you've read her bio. "During her studies...She especially enjoyed the [courses] which specialized in haute couture techniques and models to further explore the art of patterns. Over time, she began to design high quality clothes under a pure touch of creativity and elegance. It is through the consistent and continuous study of advanced tailoring techniques...that she completed at her graduation at Istituto Calligari in Milan. Each one of Teresa Farese’s dresses describes the perfect result of her fashion journey mixed with art, technique, tradition and innovation." Farese creates looks designed to evoke desire and listening to the audience comments around me, she easily accomplished this. Even though structured, there was stunning visual flow and soft drape to the garments. Love the folded drape at the hips with with accent colour to highlight - beige with black, black with beige. Fabric colour contrast was also used to highlight a label, a skirt peplum or an arm opening. The same colour accent was used with small beige buttons, outlining a aside opening on a pant leg or just a few subtle hints at the bottom edge of a pant. The off the one-shoulder and off the shoulder silhouettes laid perfectly on the models. The black dress on the right in the bottom strip really caught my eye. Honestly, words are inadequate to describe the silhouette and how subtle draping folds were created - you just had to see it. The accent ruffle down the left was just the right accent note. This collection featured garments of the highest quality. I hope one day to have a garment by Farese in my closet. It would be an honour. European designer Marko Feher brought the avant garde element to this evening. Based in Banja Luka, Bosnia and Herzegovina, the designer studied fashion design at the College of Technology and the University of Banja Luka. He presented his first collection at Banja Luka Fashion Fair 2013, won first place (in a field of 200) at the 2014 “Perwoll New Generation” in Nivea BH Fashion Week, collaborated with the brand “Funky Guerrilla” to create the "limited black edition" and has worked with many celebrities. From first to final look, Feher held the audience captive with his edgy designs in Black and white. The looks were strong and the simple black/white palette let the design work stand out on its own, I found the leather pieces particularly strong featured intricate tailoring and detailing including well-placed silver zippers. Interesting see through mesh head pieces in organic shapes were an added styling note with several looks. There was an adrogeny in the collection that will allow many pieces to find a market with both sexes. This is the third time I have had the privilege of seeing South Korean designer Hong Kiyoung on the runway at VFW. You can check out previous article at these links - Sept. 2013 and Sept. 2014. The designer bills his brand as a "Luxury Street Wear Label." An excerpt from his Sept. 2014 bio - "[Hong Kiyoung] founded his principle on ‘Minimalistic Exaggeration with street’, and is trying to disseminate it to other designers. Strongly inspired by contemporary arts that portrayed by new artists who are trying to change. He presents ‘Most elegant High-Street wear with tailored suit’ with his own wit...The new definition of men’s beauty is rising up, however, many of fashion figures are settling for the present." One recent honour was having Vogue UK feature his AW 2014 collection on their website. Kiyoung is also directing the Mummy line for the Italian show brand - Fessura. Sunday is the last day at VFW. Want to snag a tix for the last shows? Go to www.vanfashionweek.com.